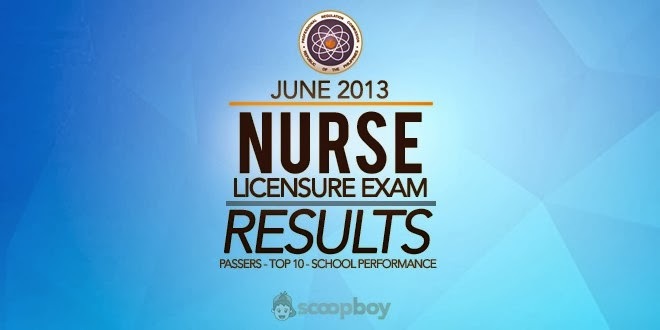 The most awaited part of the drama after the examination is finally here with the June 2013 Nursing Board Exam Result. The top notcher of the said examination is Beverly Anne Feliciano Balagon from Velez College topped the board with 87.00 rating followed by Jamila Jane Uy Borlagdan and Mylene Grace Dacula Gonzaga, both are graduates of UST and West Visayas State University with 86.80% rating. Every year, this kind of licensure examination takes place in various places in the country to determine who among those who graduated really made a patient toil to their solid grounds to reach their dreams of becoming a registered nurse. There are schools that are into ladderized programs but they have to follow the SOP in terms of giving license. And we can say that this is such a challenge that every graduate from any institution across the country to undergo with. In the end those who persevered are the ones who will pass. As a solution to this kind of issue, most students need to undergo review offered by different review centers to see to it that they will be able to recall those things that they have learned when they were still in their classrooms. They need to pay once again for the materials that they will be able to get plus the coaches who are also in the field who will spend their time trying to recall the things that the students need to recall that might get out in the examination. This is such a tradition.